This is an excellent example of the natural collapse formation of virtual sinkholes. Fortunately, is no longer used to wash taxi cabs alongside the highway to Coba, hence its popular name of Carwash, but it is a wonderful place for swimming and diving. Depending on the weather and season the open water area can be very different. 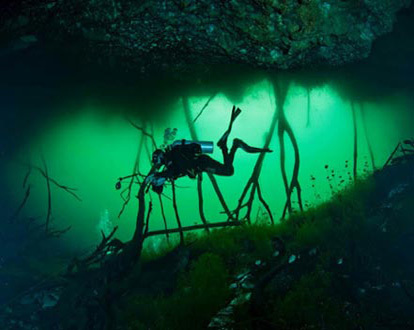 In summer the cenote has lots of tenant and green color , in winter the entire cenote is like a large crystal clear swimming pool, sparkling with a lush green bottom. A favorite spot for all underwater photographers and upstream you can find chestnut colored columns below the shallow depths of fallen trees and roots. The light falling through the algae layer above creates an amazing show of varying hues.